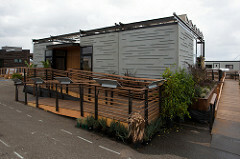 The University of North Carolina at Charlotte’s UrbanEden house placed 13th overall at the U.S. Department of Energy Solar Decathlon 2013. The team won the People’s Choice Award and tied for third in the Engineering Contest. The UrbanEden house returned to the University of North Carolina at Charlotte’s campus after the competition. The university hoped the house could continue its mission by serving as an education and research facility. However, UrbanEden was dismantled and recycled when it was determined that reconstruction was not feasible. The house did leave a legacy. In addition to its Solar Decathlon 2013 achievements, UrbanEden also won the Sustainable Business Award at the U.S. Green Building Council Green Gala in September 2014.